This paper aims towards a critical re-evaluation of Participatory Design processes based on a completed collaborative research (2015) in rural China. The study involved two complementary disciplines; the Applied Social Sciences and Design and their corresponding research methodologies; Action Research and Participatory Design aligning the social and the physical. 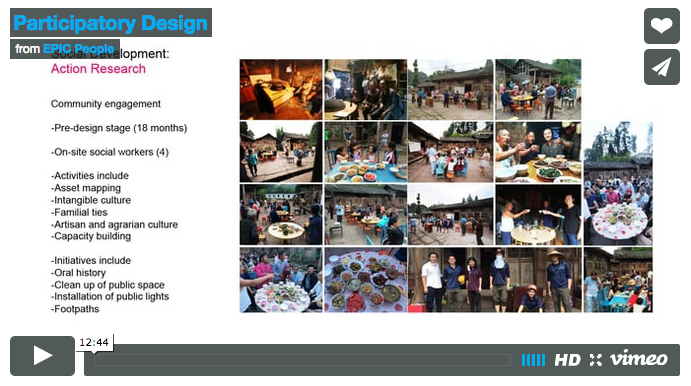 The resulting design and implementation of a community kitchen in rural China enabled villagers to develop social enterprises and new types of collective organizations. With Action Research providing the necessary ‘software’ for social organization and engagement, facilitating the development of ‘hardware’ or design outcomes through participatory processes. Beyond design and social outcomes, the study raised questions concerning the critical, conceptual and praxis underpinnings of Participatory Design that impact its effectiveness as a tool. Participatory Design, sometimes panacea for an objectified and corporate driven field, often remains focused on design as outcome rather than on process or the development of outcomes embedded in a social context or based on non-commercial values. Complex design processes involving multiple stakeholders in design development may also result in an over-simplified outcome or a lowest acceptable solution approach. Additionally Participatory Design understood as a purely consensual process often ignores the complex negotiations tensions and conflicts between different forms of knowledge; characterized as the ‘nightmare’ of Participatory Design processes (Miessen, 2010), whereas it may in fact be the tension in the process that leads to paradigm shifts and possible ‘real’ innovations. A viable starting point for re-evaluation of Participatory Design methodologies therefore repositions it within complex social and materialization processes; in which design outcomes become the formation of socio-material assemblies, constructed within processes that span both before and after the design stage. It is useful to contextualize this process in terms of emerging changes in social systems that are evolving the ways both the social and design processes are developing towards distributed forms of knowledge, collaborative processes and cross-disciplinary practices (Sanders and Stappers 2008). These changes are impacting the ways we understand tangible and intangible culture and the nature of artefact or object, inasmuch as design or artefact are increasingly reconfigured as a relational matrix intrinsically connected to social (and sometimes technical) contexts. In other words outcome should be considered as a design object together with its attributes and relations, or as a socio-material assembly (Latour, 1999). This highlights the importance of knowledge (generation and transfer) as parts of the interconnection of the social and the design process on the one hand, and between the different heterogeneous fields of knowledge and the negotiations these entail. The paper therefore explores how understanding the role of complex knowledge generation in the design process can lead to a critical repositioning of Participatory Design. Drawing on work by Bjögvinsson, Ehn and Hillgren (2102) who posit Participatory Design should move from a conventional understanding of designing “things” (objects) towards designing “Things” (socio-material assemblies). Their reconsideration of the etymological meaning of “Thing” as (public) assembly or as the gathering of properties or attributes is critical. In other words, “Thingness” is the socio-material assembly that Latour (1999) characterizes as “a collective of humans and non-humans,” both relational and complex. The paper will also reference the ‘design before design’ and the ‘design after design’ issues highlighted by Bjögvinsson et.al., as an intrinsic part of this process.